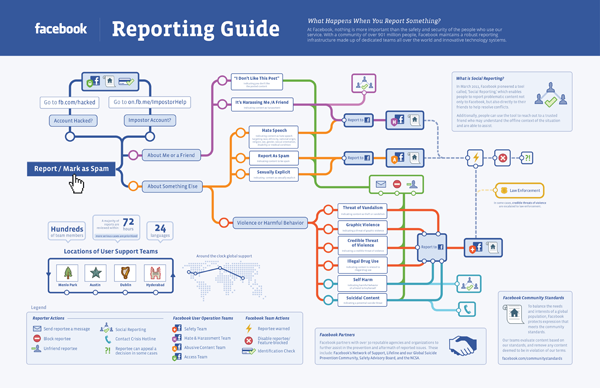 What happens when you click “Report” on Facebook? As a Facebook scam-busting site, we often ask our readers to report scams, spam and other offensive content. Have you ever wondered what happens once you click the report button? We certainly have, and we have often wondered what, if anything, gets done by Facebook in return. In all fairness, policing a site with almost a billion members is no small feat! The Safety Team will contact law enforcement authorities when credible threats of violence are present. It is important to note that Facebook doesn’t go at it alone. They are partnered with over 30 agencies and organization that help in the prevention and aftermath of reported issues. The include: Facebook’s Network of Support, Lifeline and our Global Suicide Prevention Community, Safety Advisory Board, and the NCSA.